I was on the Fourth Plinth in Trafalgar Square on Monday 6 July at 11am. I launched 60 balloons despite the fact I got soaking wet, balloons blew away, and cards fell apart. Luckily I had spares and was able to keep going. 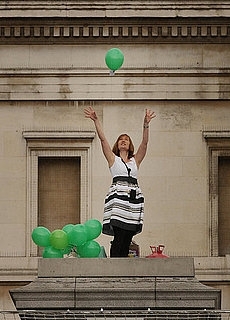 The 60 balloons represented my 60 minutes on the plinth. They had been 'bought' by friends, family and colleagues by making a donation to their favourite charity. The really stunning part about this, is that from the 71 donations, over 50 charities are represented both large and small. There are 4 hospices, a school, 2 animal charities, many medical organisations as well as social justice and environmental charities. It makes a very interesting list and is a living 'portrait' of who we give to and why. © Copyright JuniperLyme Ltd 2009. All Rights Reserved.